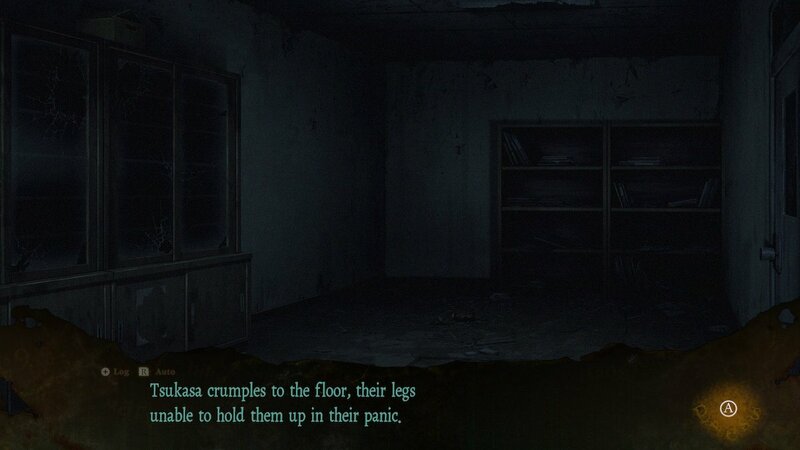 Last year I had the opportunity to review another creepy game published by Aksys called Creeping Terror. 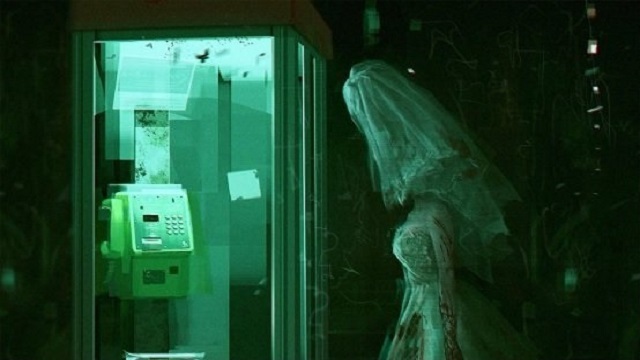 I ended that review saying I hope the company isn’t done bringing over creepy games stateside, which brings us to today’s review of Death Mark. Though developed by a different team than Creeping Terror, Death Mark instantly struck a similar chord with me. There are definite differences, such as this game taking place on PC, Switch and PS4 and the other taking place on 3DS and PC, as well as this one being a horror visual novel while the other was more of an action game. I didn’t know exactly what to expect from it, but I was confident Aksys would make good on bringing over another Halloween horror. Was this a white-knuckled ride into terror? Or was it just a simple jump scare? Death Mark starts with two unnamed female students discussing a horrible rumor about a teacher who had disappeared after finding herself with a strange mark on her skin. This mark supposedly also causes amnesia for the bearer, followed by horrible death soon thereafter. Cut to a curious man wandering around with no idea who he is. 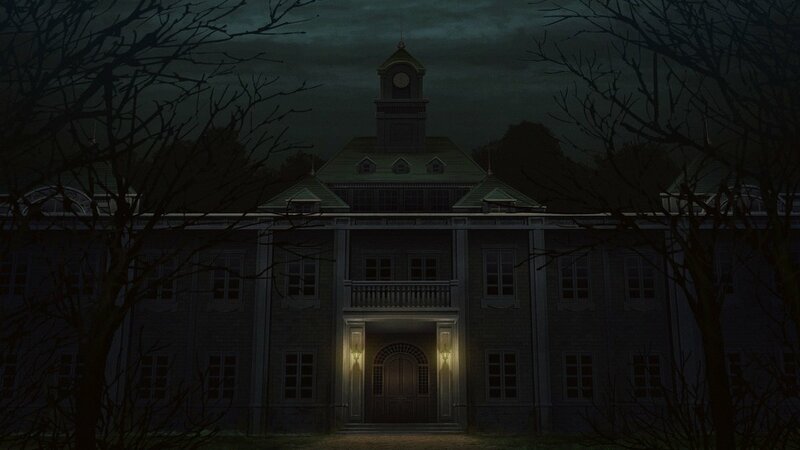 He finds a card in his pocket from a Saya Kujou inviting him to her mansion to get help. Thus the man wanders towards a menacing abode where he is quickly drawn into a dark mystery. Upon entering the mansion, things quickly start to get weird. Not surprisingly, the man has the same strange mark on his wrist, but that’s not the worst of it. 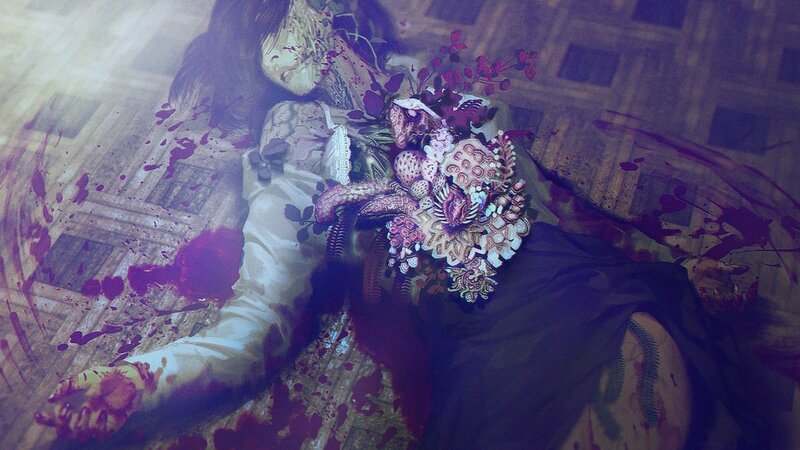 Once he’s in the mansion he discovers a grisly scene as he stumbles upon the corpse of Saya Kujou, who seems to have been murdered by the wild plant growth protruding from her chest. As if that wasn’t enough, the man then comes upon what appears to be a marionette on a couch. When the marionette opens her eyes and begins to talk, it becomes very clear this game is full of supernatural mysteries. 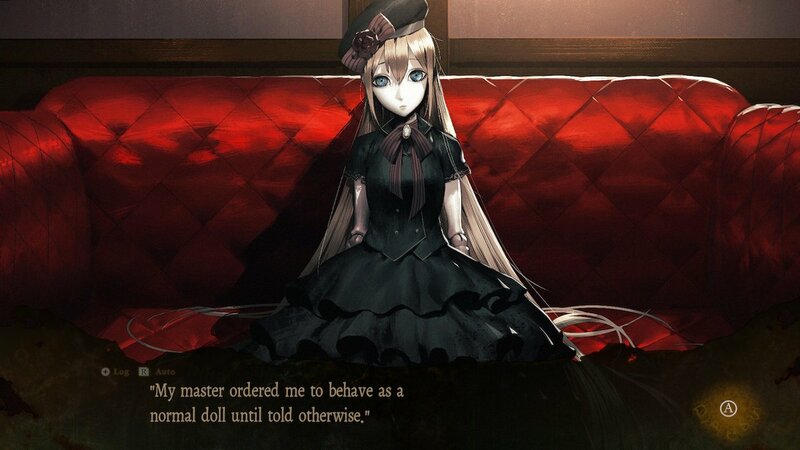 Once you have been introduced to the marionette, who is fittingly called Mary, you’re given the option to name your character and alter his outward appearance from a few pre-set options. I stuck with the name the game provided, Yashiki, and gave him some grizzled facial hair. Mary continues by telling you that the strange mark on your wrist is the cause of your amnesia, and that the source of the marks themselves are unholy spirits born from humans who died in a horrible fashion. Their grudge towards the source of their demise brings them back to life, and only by defeating them can you remove the mark. Enter a motley crew of others afflicted by the mark, and things get rolling. 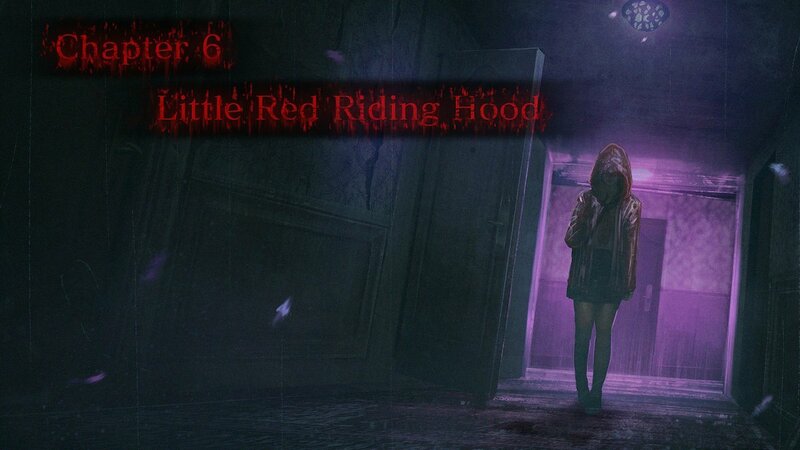 Each of the game’s five chapters introduces new compatriots, as well as a menacing spirit you’ll have to overcome. You might be wondering how you kill a ghost, and you wouldn’t be alone. Mary quickly clarifies you can’t kill them per se, but you can manipulate their grudge to banish them. Essentially, it’s like a Scooby-Doo episode, but with real murderous consequences if you fail. Your job is to research what caused the human that birthed the spirit to perish, and using that knowledge, put them to rest. It’s a lot like being a police profiler. Your understanding of the subject directly affects how you contend with them. Better yet, there’s a good and bad way to beat each spirit, and depending on which you inadvertently pick, you might get the good or bad ending for the game. Essentially, the wrong choice will give you victory at the cost of your partner, while the good ending requires everybody to survive each chapter. As for the flow of the gameplay, it’s pretty easy to understand. You discover a new spirit, investigate an area to find clues and items, and use them to defeat the spirit before you succumb to the mark. It’s a bit more complicated than it sounds, though, since these spirits don’t just wait for you to defeat them. There are segments you’ll encounter each chapter where you are presented with life-or-death scenarios, such as being assaulted by a ghostly hound. Depending on your choice of actions, you will either survive or perish. Luckily, you have a bit of a defense against harm. Each chapter you start with something called Soul Power, which is essentially your timer for making life and death decisions. If you continue to make the right choice during these sections, you’ll get through with Soul Power to spare, but answering incorrectly depletes it dangerously. If it goes to zero, you die. Thankfully, when this happens you’re allowed to try again or restart from your previous save, which makes them not quite as frustrating. Better yet, by finding worn-out talismans, you’ll be rewarded with a Soul Power boost. These dangerous segments start out pretty easy to figure out, but tend to get more and more complicated later on, often requiring great intuition on your part. Thankfully, by carefully reading any clues you come upon and referencing a handy feature called the Spirit File (essentially a recap of the chapter’s events that is constantly updated) you’ll have a good chance to succeed. You might even find some hints if you read all the material carefully. Though the chapters are relatively linear, it’s still easy to get a little lost. To interact with your environment, you move around your flashlight beam with the left Joy-Con stick. When it reveals an item of interest, you’ll see a flicker of light on the screen. That indicates you can interact with something in the environment. If it’s something relevant, you’ll be able to feel it, examine it or tinker with it using an item in your inventory. You’ll come across a lot of items in your investigations, and the game requires some creative thinking. For example, I had to defeat a lock with my letter opener one chapter, and had to use chemicals to make light to scare away snakes another chapter. Thankfully, you’ll always have the items you need to succeed by being thorough and looking in every corner. What you might not find, however, are the key items required to progress to the good ending. That takes some extra sleuthing on your part. The writing for the game is pretty solid, and there’s a large cast of quirky characters. There’s an idol, a couple scientists, a mystic, a punk and even a massive anime nerd. That’s only some of the characters, and in total they add a lot to the emotional fabric of the game. While not every character gets the same amount of development, there were several I enjoyed interacting with. Perhaps my favorite was the by-the-book and totally not afraid of the supernatural Hiroo, but they all were pretty interesting. Thankfully, the cast isn’t just there as window dressing. Each of them suffers from the same mark, so they work with you to help remove it. They also can help with your investigation, and depending on your partner, you may find some options for investigation that are otherwise unavailable. Most important of all, your partners help you when you face off against the malevolent spirits. These spirit battles aren’t exactly fights per se. Despite the stats you’ll find on the character screen, Death Mark isn’t a RPG. It’s not even an adventure game, really. Each fight is more of a test of your understanding of the spirit you face. By truly comprehending their psyche, you’ll be that much better equipped to combat them. For example, the first spirit you face is afraid of blood, so by using a ghastly blood soaked umbrella against them, you can render their attacks useless. The goal in each fight is to defend against the spirit’s attacks and draw them closer. Once they’re right in your face, you can weaken them and then exorcise the spirit with the right combination of items. The game will indicate when you have a viable combo to use, though on occasion the right combination of items is not so apparent. Thankfully, most of the time it’s pretty clear through trial and error which items to use to succeed. You might think that makes the fights boring or not scary, but that couldn’t be farther from the truth. 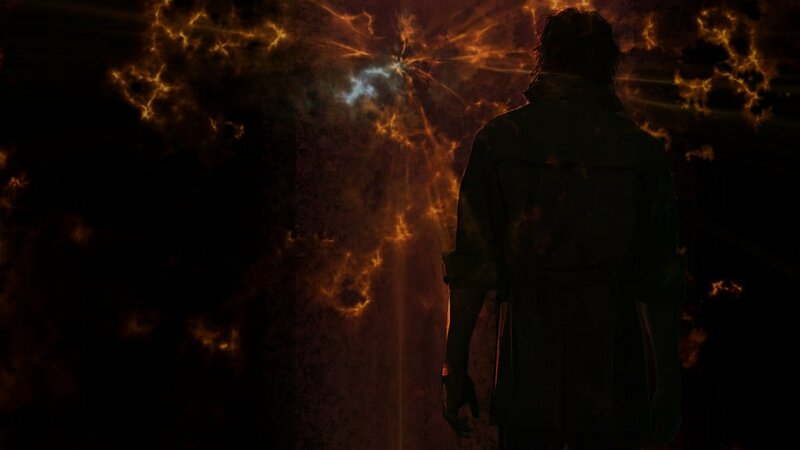 Each is a harrowing encounter, made even more so by the visual effects of the game. Visually speaking, this game is a horror masterpiece. The hand-drawn 2D art bursts with personality and menace, especially for the characters and spirits you face. Likewise, the environments you explore are all drowning in darkness, and makes you feel you can sense horrors waiting to attack from every corner. Perhaps the best visual effects are for the spirits themselves, which are all horrifying and deranged creatures that truly instill terror in you. But it’s not just the visual side; the sound effects are also fantastic. The music is somber and mysterious, with piano tunes, which pushes you to keep going. It gets very tense and frantic during the life-or-death sequences, and especially during the spirit encounters. I especially enjoyed the gotcha moments peppered throughout the chapters, such as your flashlight coming across a ghostly face who floats away laughing cruelly, or sound effects startling you like animals roaring or chainsaws revving. In conjunction, the visuals and sounds do a great job of keeping you constantly on edge, which is perfect for a horror game like this. There’s a lot I enjoyed about Death Mark, but I do need to spend some time talking about a few missteps. While it’s generally clear how to proceed through most parts of the game, it can occasionally be overly unclear. I said earlier that your partners can help you in unusual ways, but they can also be a hindrance. On occasion I came across parts of the game where my equipped partner was actually preventing me from proceeding, such as when I had to get past a ghost dog and was partnered with Eita, and every choice I made ended with death. I didn’t realize I needed a female partner to get past the beast until I found an online guide. This partner issue can also affect spirits. When facing the second spirit in the game, I needed to weaken it enough to deal the final blow. However, two out of my three partners wielded unique items only they could use, in this case a pistol and a baseball bat. Since my partner at the time had no specific weapon, I wasn’t able to do enough damage with the items in my inventory, and was unable to proceed until I switched partners. Another less significant issue was the translation. For the most part it was okay, beside some misspelled words here and there. What was more galling to me was when the game used generic gender pronouns to refer to my partners. Instead of ‘his’ or ‘her’, it was always ‘they’ or ‘their’. It’s not the end of the world, but it hurt my immersion whenever that happened. And finally, though I do think you can beat the game without a guide, it’s much, much harder to get the good ending without one. I ended up using a guide to get the good ending for my playthrough, and I frankly doubt I would have been smart enough to figure out some of the solutions without it. Thankfully, there’s nothing stopping you from playing through the first time to get the bad ending and then using a guide afterwards for the good ending. The DLC is a follow-up to the events of the main story with a new twist. Despite my small issues with Death Mark, overall I was pretty pleased with it. Though it is a little pricey at $49.99, I feel it was a well-rounded and frightening adventure. You’ll get caught up with the plot and unraveling the mystery at the heart of the game, which will only fully reveal itself with the good ending. I spent about 10 hours beating the main game, and upon doing so with the good ending, you’ll unlock the final DLC chapter. For consoles, this DLC is absolutely free, which is even more added value. If you’re a fan of horror and want more scares on your Nintendo Switch, you really can’t go wrong with Death Mark. It satisfied this fan of Creeping Terror and was different enough to keep me interested. It’s good to know Aksys Games is still a great purveyor of quality horror. Next Post:Kanon Shizaki to Replace Satomi Akesaka in BanG Dream!